Quickly analyzes the storage space on your phone and identifies all unnecessary data. 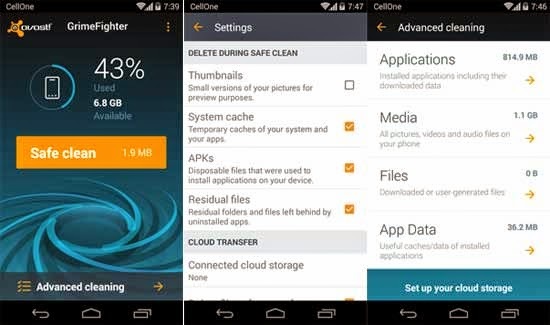 Safe Clean feature instantly cleans up unimportant data, system caches, gallery thumbnails, installation files, and residual or unused files and APK. The Advanced Cleaning option gives you a detailed overview of all the data on your phone. Categories ― applications, files, media, and app data ― enable you to comfortably check and organize specific data files and clean them one by one or sort them by size. Uninstall and clear out unwanted applications with just one tap. The Ignore List is a great way to mark data you don't want to be cleaned.